Have you ever walked (or dejectedly shuffled) into the practice room, begrudgingly opened your case, assembled your instrument….and wondered what the heck you have to practice? Maybe you’re overwhelmed with excerpts. Maybe you have to learn your scales for All State auditions. Or maybe you don’t even know what you should practice. Not to fear, my trusty Practice Pyramid is here! You’re probably familiar with the food pyramid from health classes past. It’s undergone a few makeovers recently, but the basic idea is essentially the same. A daily diet with the right proportions of certain foods will increase your overall health. Like the food pyramid, your practice routine should also have balanced proportions of fundamentals and repertoire. Practice pyramids may differ slightly for each musician, depending on age, skill level, weaknesses, and personal/professional goals. Below, I describe the elements of my personal practice pyramid. 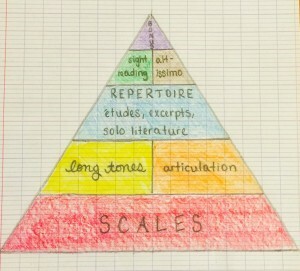 Scales: Scales are the fruits and vegetables of your musical diet. Like fruits and veggies, there is quite the variety of scales, and you should sample them all for optimal musical health. Scales are the foundation for all music, and I believe that they are the single most important thing you can practice. Daily scale work is the easiest and fastest way to improve technique, agility, and finesse. Need some “recipes” to spice up your scales? Here are 52 ways to practice your scales. Long tones: As a former non-believer of the power of long tones, I am now a dedicated long tone enthusiast. Nothing can turn a sound around like consistent long tone practice. In addition to your sound (aka musical voice), long tones can improve tone, tuning, timbre (believe it or not, these are three distinct qualities), breath support, lung capacity, air control, and connection between notes. This is the first thing I play every single day, and the only reason that I didn’t put long tones as the foundation of the practice pyramid is because too much time on long tones causes embouchure fatigue – not good for the rest of your practice session! Articulation: For my fellow Zelda fans out there, articulation completes the warmup Triforce (along with scales and long tones). It is crucial to develop and maintain fast, light, clean, and symmetrical articulation in all styles and patterns (legato, staccato, marcato). You should practice articulation daily, but keep in mind that articulation is best practiced in smaller increments to avoid tongue fatigue. This is probably the only element of practice which gets worse the more you practice, so make sure to focus to get the most benefits during your articulation regimen. Repertoire: This is the meat and potatoes of my musical diet (tofu and potatoes, since I’m a vegetarian). This includes études, orchestral excerpts, solo literature, and any other music for band, auditions, or performances. Make sure to allot enough time for each piece during the repertoire portion of your practice routine. Sight-reading: Consider sight-reading the omega-3 fatty acids of your musical diet. Great in concentrated doses, but not necessarily more effective in larger quantities. Sight reading skills are developed over time, so don’t cram this into a few practice sessions. Consistent sight reading will yield the best results. For more help, here’s my advice on becoming a master sight reader. Altissimo: Beautiful high notes take work (sad, but true). It’s all about using your air, having great fingerings for each note, and not pinching the embouchure. Spend a few minutes each day expanding your range and perfecting your altissimo chops. Like articulation, too much altissimo practice can fatigue embouchures (not to mention alarm any dogs within a five-mile radius). Bonus: This is the decadent chocolate cake, tiramisu, New York cheesecake, double fudge brownie – insert dessert of your choice – to your musical diet. Be sure to occasionally indulge on music that you love. Maybe it’s Disney soundtracks or favorite pop songs. Dedicate a few minutes towards music for music’s sake. No analysis, problem-solving or critical thinking. Just have fun! The most important principle of the practice pyramid is balance. There will be some days you skip scales, or have a double dose of repertoire (just like there are days when I eat chocolate and cheese for dinner. #parisproblems). Don’t let one bad day deter you from your journey. If you regularly utilize a practice pyramid, you will continue to improve and grow into a balanced and healthy musician. Last note: Exercise. How can musicians “exercise” to supplement this musical diet? Through auditions, performances, recitals, and teaching. Music doesn’t exist until it is shared with others. A healthy musical diet includes work both inside and outside the practice room! 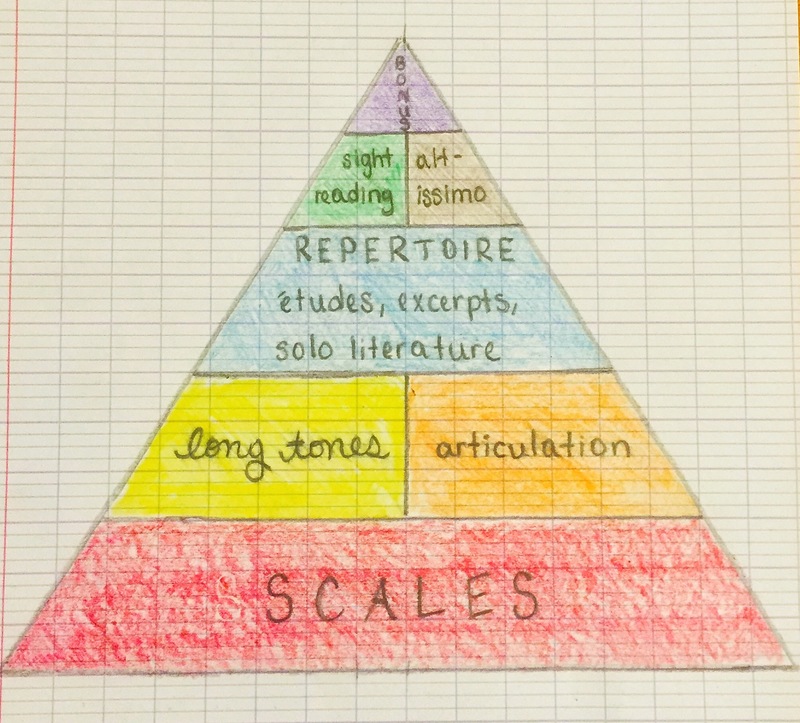 What does your musical practice pyramid look like? Share in the comments below! Interesting… I always thought about scales as being the base of everything and almost always I initiate my studies with scales, but I really appreciate your idea about how to balance studies. Actually, I am a violin student and I will have to adapt it to my studies. But I thing it is a good studies approach.